Not sure if Pilates is for you? Maybe you’ve seen videos, infomercials or classes at the gym, full of women in leotards, working on mats or machines. Can’t be that hard right? What are the benefits? There is challenge, resistance, and weights in Pilates, and it’s not just for young co-eds or soccer moms. Women, men and kids of all ages benefit from Pilates: people from every range of body shape and athleticism (or lack thereof). Best of all, the benefits aren’t just physical! Better Posture. Standing properly automatically makes you look 5-10 pounds slimmer – and that’s a fact! Pilates starts with good posture and incorporates it (and grace of movement) into your life. You’ll find yourself standing taller, engaging your abs, relaxing your shoulders and moving with a lightness you didn’t know you possessed. That’s right, your workout gets fun with Pilates on the table! You can work out with a ball, with a band, with a ring – there are tons of fun props to use as you get more and more into this fun and enjoyable workout routine. Too many new exercise advocates forget an important step, jumping right into jogging, lifting or other activities and skipping the warm-up. Pilates has stretching built in, so you don’t injure yourself on the first day. Be kind to your muscles and joints and keep your mobility. Pilates stretches hit multiple body areas as well – so, for example, you can harden your ab muscles while you stretch your hamstrings at the same time. Core Definition. It’s all about the midsection in today’s ab-obsessed society. 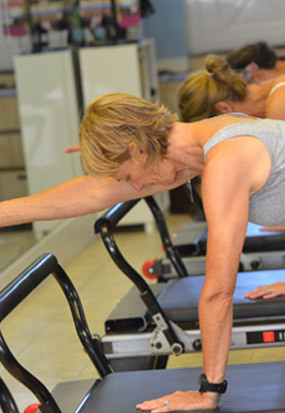 Pilates doesn’t disappoint; the core is what it’s all about! Every single exercise focuses on keeping your core engaged, so you exercise from the center (your core) outward. This alone will help pull in and flatten your belly over time. Stress Relief. This could really be one of the best benefits of Pilates. Since you have to concentrate on the finer details of each movement – such as the exact position of your feet, legs, neck, arms, shoulders; remembering to breathe properly; and keeping your abdominals engaged at all times – you get to drop everything else from your consciousness and get a break from the worries of the day. The result is a more relaxed, rejuvenated you! If you’re not sure, give Pilates a chance. You will be pleasantly surprised!